Amusingly, Corbyn does not follow the usual friend reputation sequence of Stranger - Pal - Buddy - Friend - Good Friend - Best Friend, but rather has Stranger - Curiosity - Non-Threat - Friend - Helpful Friend - Best Friend. It took me less than 2 hours in a raid with 10-20 people to become Best Friends with him. Warning! When you turn in items for rep the person will take ALL of them so be very careful when near/at Best Friend. This is most likely because Corbyn is a crow. The fisherfriends seem completely pointless. I mean, you're literally standing right next to them... fishing. For rep. IF you have not finished the Truthguard quest or any other scenario on the island, it will automatically move you into the scenario. Trying to leave instance group will port you to the mainland. You can fly out in the ocean and it drops but every time I returned to land it popped me back in. I don't get any Something's Fishy buff when I'm standing near Corbyn, nor standing at the water near him. I walked up & down the coast a bit but the buff never appeared. I fished a little while on the coast nearest to Corbyn but only got silver mackerels & a couple stormrays. WHERE do I have to be in order to get his buff? WHERE can I fish up his special "pebbles"? When saving up totem fragments to purchase the bobber and pet be careful you don't end up giving the bird all your fragments because you've been doing that for the past few hours. Blizzard didn't have the common sense to prevent you from wasting fragments for rep when already at max level. Corbys is on the island of Shield's Rest which is off the northeast coast of Stormheim. On the middle east side of the island you will find him just down from the flight path. 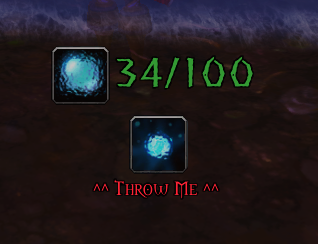 I haven't done a single quest in Stormheim and my fishing is only 410. My first cast while standing next to the wreck of the boat got me a Shiny Bauble. Stand between the ship on your left and the rocks on the right. The best thing to do really is to find a party with the Group Finder. Click on Premade Groups and just type in 'Corbyn'. This can be done for all the Fisher Friends. Drag the macro icons to an action bar. The icons for the tool tips will be the default red question mark until you make your first catch. Then the icon will change to the inventory icon with the count. When you turn in Shiny Baubles or summon Ancient Vrykul Spirit using the Shiny Bauble, the count will go to zero but the icon will remain. If you're solo fishing when Something's Fishy is up, it's really useful to know whether you've caught a Shiny Bauble because you can only have one in your inventory at a time. As soon as you catch an White Sparkly Bauble, the icon (with count) will replace the default icon. If you turn in White Sparkly Baubles, the icon will remain and the count will go to zero. Keep Arcane Lure up to increase your chance of catching bait that attracts rare Stormheim fish. I am absolutely FURIOUS... I got to best friend, but now I was trying to buy some lures to get rare fish, so I go fishing up baubles... fine. BUT the only choices are "do you want shiny baubles, or "would you like shiny baubles" which both choices kinda say. Well, one presents you with items to buy and the other takes everything you've fished up. Damned if I didn't manage to choose the WRONG one, so an hour spent fishing totally wasted. Absolutely disgusting design to try and hoodwink folks... trying to be cutesy-poo. Corbyn requires 560 Shiny Bauble to become Best Friends and an additional 150 for his two unique items for a grand total of 710 Shiny Bauble required. A raven with bright, intelligent eyes and a love of fish.